We love books. (You probably know that by now.) And my kids love to be read to while they eat lunch or play with clay or sit in the hammock chair on a gorgeous spring day. 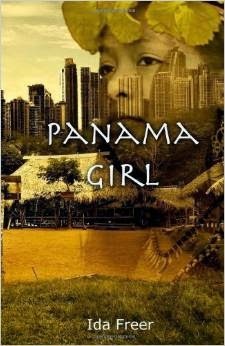 One of the latest books we read together is Panama Girl by Ida (pronounced EE-duh) Freer. This is a story about a 12-year-old girl named Surni from the Embera people in the Darien jungle of Panama. As you read, you get a clear picture of life in the village and how the Embera have lived for generations by finding everything they need for food, clothing, shelter, and transportation in the jungle. But change is coming to the jungle. Visitors from Panama City are arriving with increasing frequency and Surni and her people must learn to adapt to new ideas, new technology, and new beliefs. Surni herself faces many challenges and proves that she is a girl of great courage, love, and intelligence. Panama Girl is a self-published book and though it is in its second edition, it could use a good scrubbing by an editor to correct some annoying blunders (missing words, completely random and useless commas, etc). Several times I was halted in the midst of my reading by these errors which distract from the flow of the story. But typographical issues aside, it is a great story! Ida Freer's website seems to indicate that this book is geared toward the middle school aged child, but that seems a bit old for me. It was perfect for my 4 and 7 year olds to listen to aloud and would be a great book for an 8 or 9 year old to read, in my opinion. That isn't to say an older child might not enjoy it, but the vocabulary is a bit simplistic and repetitive. It'd be easy reading for an older child; not challenging literature. Of course, everyone needs some easy reading mixed in with their challenging stuff too! There are a Teacher's Guide and Student Workbook for this book available from www.idafreer.com. We didn't "do" anything academic with the book...just enjoyed the story. Go here for more information about the Embera. Note: from that page there are links to photos of the Embera people, some of whom are a bit too nekkid for Western liking. Just saying'. You've been warned. Disclaimer: I did not get this book free for review; I bought it with my own money from Amazon like a regular person. I just wanted to write a review since we enjoyed it so much. Guess I didn't need a disclaimer after all.